Poetry can celebrate the good times while dealing with the trying times. N.J. Jones knows girls have important things to say. POETRY GIRL© tells the story of next-door neighbors and friends, two girls who write poetry to deal with events and emotions, while growing up in a lively subdivision in the Sixties and Seventies. Kelly Kaufman is the youngest of four children whose father blames her for her mother’s illness. Annie Blankenship, the narrator, is an only child fascinated by the people and relationships around her. Kelly’s mom babysits Annie, who bears witness to it all and is compelled to tell Kelly’s story, along with her own. The girls’ adventures and trials are charming, poignant and sometimes heart-wrenching, but most of all real. 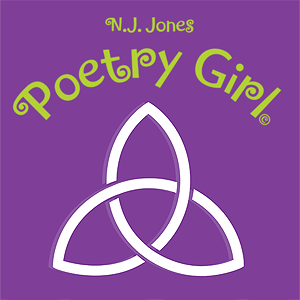 Author N. J. Jones incorporates plenty of poems written by both girls to tell the stories that matter to them both. It’s a story that sweet, creative daughters and kind-hearted and protective mothers and fathers can share. Jones encourages mothers and daughters to give voice to their own poems and stories. N.J. has written poems since she was a child and has always loved stories and the multitude of thoughts and delicious words that create stories. Read the Poetry Girl Poem-Play on your Kindle or Nook or listen to the script performed by University of Cincinnati CCM, Acting students. She likes to give back. That’s why she is earmarking all proceeds of POETRY GIRL© to be divided among three non-profits: Women Writing for (a) Change, University of Cincinnati College-Conservatory of Music, Acting Program and Circle Tail assistance dogs.